When writing Time Signatures, it is important to not write Fractions! 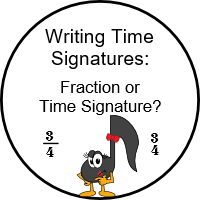 What is the difference between writing Time Signatures and writing fractions? Let’s discover the difference so that we don’t write fractions when we are supposed to be writing Time Signatures. A Time Signature is a musical notation that tells how many beats (counts) are in each measure and what type of note equals one beat. A Fraction is a mathematical notation that represents a specific number of parts and how many you need to make a whole part. It is a numeric quantity that is not a whole number. Can you see the difference? A Fraction uses a line between the numbers. A Time Signature does not. 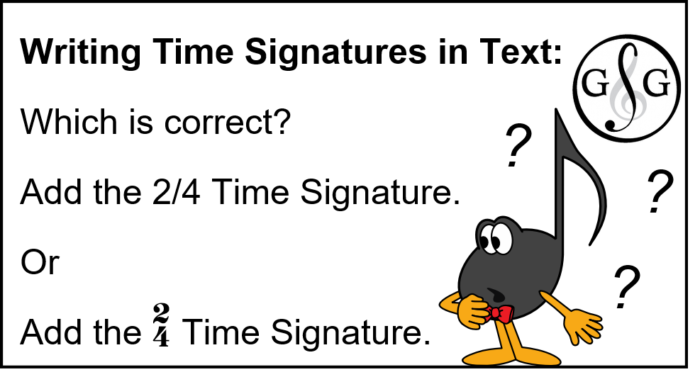 Writing Time Signatures (and not Fractions): Is there a Difference in Pronunciation? Using a Computer, when writing Time Signatures in text (and not in music), it is really difficult to write the top number above the bottom number. We often see a fraction used instead of an actual Time Signature so that the 2 numbers fit on the line of text. Seeing this line can confuse a student – when they see it in the text, do they write it on the staff? Every time you see a Time Signature written in the text of the Ultimate Music Theory Workbooks and the Supplemental Workbooks, Glory St. Germain and I had to insert an image of the Time Signature into the text. However, when using a Computer to type in, for example, a Word Document, it is impossible to write a "2" above a "4", so we often see the fraction "2/4" instead of the Time Signature. It is important for Teachers to avoid use a Fraction as a Time Signature when writing the numbers in Text! Writing Time Signatures using a computer program (or “drag and click” program) is not the same as learning the proper way of writing Time Signatures using pencil and paper. Students who only learn theory using an online “click yes or no” theory course miss out on the absolute joy and satisfaction of theory – the hands on component! A Computer or Music Writing Program uses a program that creates a special “look” to the numbers. When writing Time Signature Numbers using a pencil (hand written), all that shading and fancy “stuff” is not required. The top (upper) number is written inside the top 2 spaces (between lines 3 to 5) of the staff (spaces 3 and 4). The bottom (lower) number is written inside the bottom 2 spaced (between lines 1 to 3) of the staff (spaces 1 and 2). There is no extra line in between the numbers. The line that is seen in between the two numbers is part of the Staff, and is not a separate line. What Time Signatures are Required at Each Level? The Ultimate Music Theory Series can be used with all students. For Students who are preparing for RCM Theory Examinations, adding the Ultimate Music Theory Supplemental Workbook Series (and using the Ultimate Music Theory Exam Series) will add the new History, Harmony, Melody Writing and Analysis Components now required in the RCM Theory Syllabus. 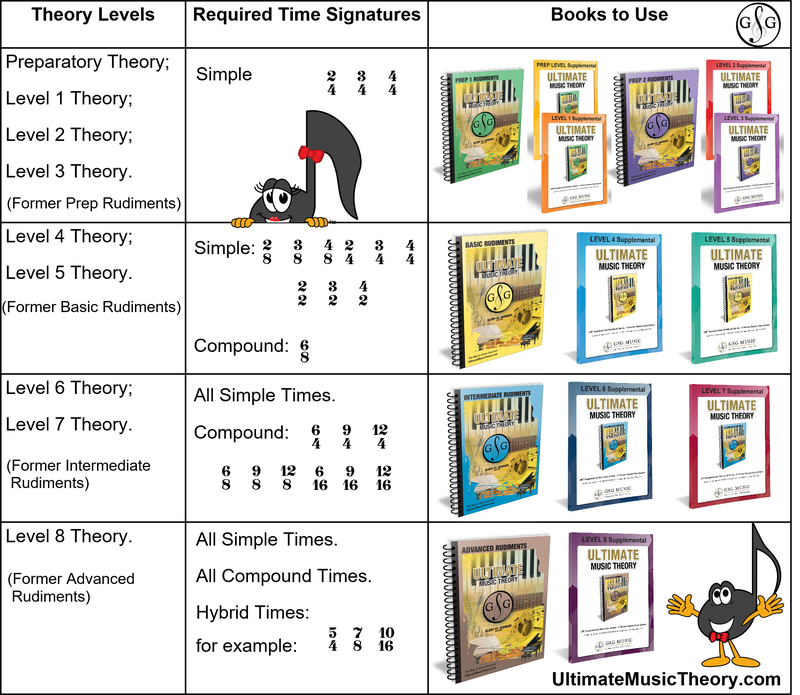 For Teachers who are teaching the new Theory Requirements, I would highly recommend that you work through the Ultimate Music Theory Complete Rudiments Workbook and the corresponding Complete Level Supplemental Workbook. You will fill in any gaps in your own Theory, History, Harmony, Melody Writing and Analysis “learning” and you will definitely build your own confidence as a Teacher and as a Musician! 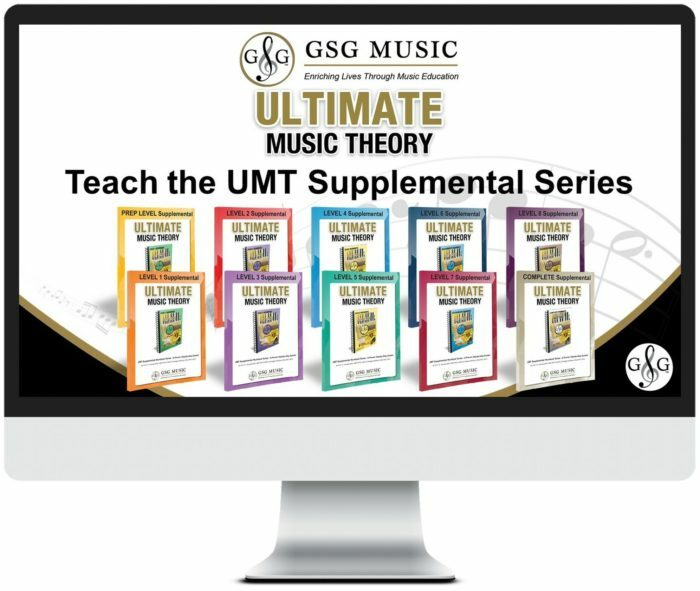 The Ultimate Music Theory Series has Answer Books that exactly match the Workbook, Supplemental and Exam Series books. All the History Resources are available (FREE) for you on our Website! Just visit UltimateMusicTheory.com.